Our blaring alarm jolted us from deep sleep at 4.00am like a bad nightmare. We tiredly pulled on several layers of clothes, grabbed our pre-packed day bag and left our hotel at 4.30am in the pitch black. We carried torches as just outside of town there were no street lights. 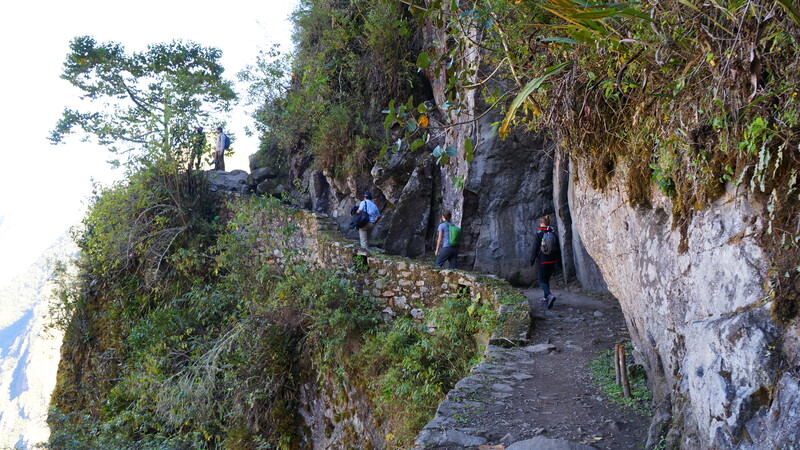 It took around 30 minutes to reach the start of a strenuous one hour up-hill climb which leads to the entry point of Machu Picchu. In the dark we were joined by dozens of other people also making the climb in order to be allowed first entrance at 6.00am and have the chance to see a spectacular sunrise over the site. We could see a stream of torch-lights twinkling above us. 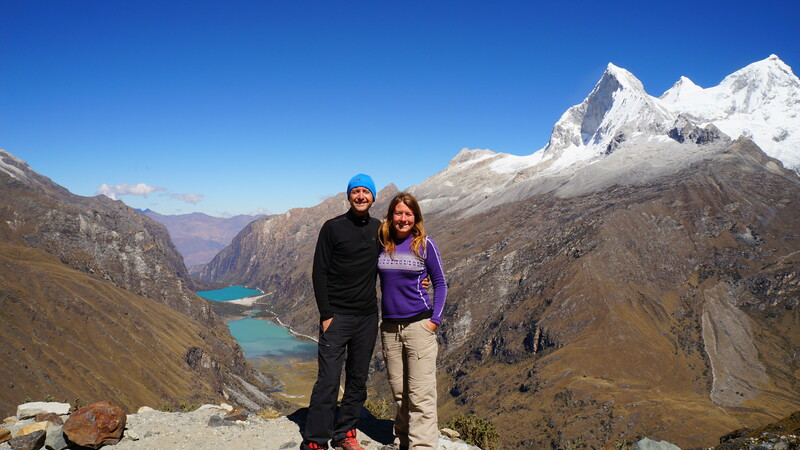 We kept telling ourselves to take it easy and climb slowly but we felt the kind of pressure and anxiety you’d feel in a race and when someone overtook us we pushed on faster still – grunting, groaning and sweating all the way to the top. Our legs were like jelly when we reached the entrypoint at 5.50am. A queue of around 100 people had already formed and as we waited more and more piled in behind us. 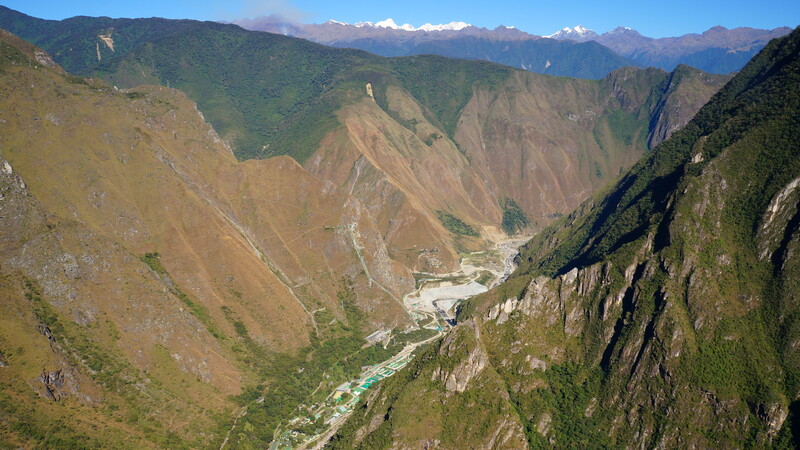 It’s also possible to take a bus from Aguas Calientes to the site (25 USD return fare) which only takes around 20 minutes. It was amusing to see some rivalry between those who’d walked up and those who’d taken the bus – understandably when you’re feeling hot and sweaty after a 1.5 hour walk, the last thing you want to see is someone stepping off a bus looking fresh-faced and without a hair out-of-place! 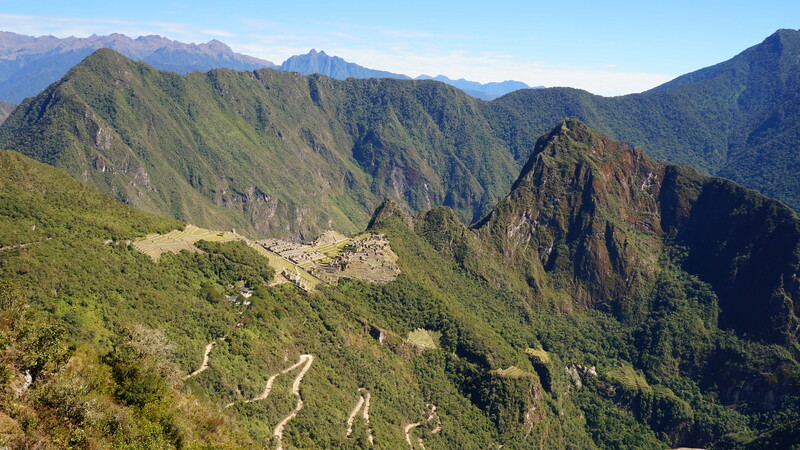 3) Machu Picchu site, the nature reserve and Huayna Picchu (another sacred mountain with ruins). For this option it is necessary to book in advance as there is only a limited number spaces each day. 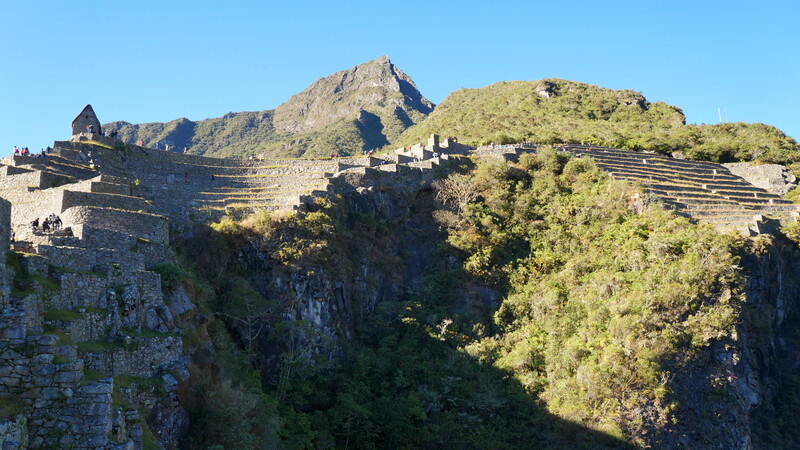 We chose option 2 but as there was so much to see at the Machu Picchu site alone and because entry to the nature reserve closed at 11.00am, we didn’t make it there. 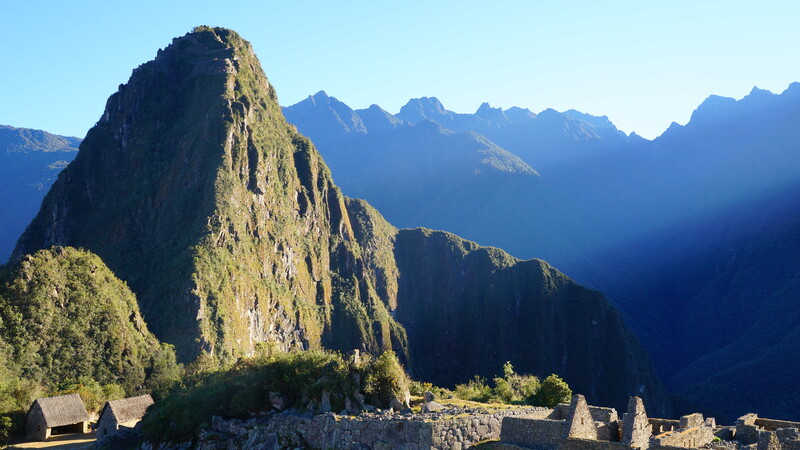 We’d seen and heard so much about Machu Picchu that we were worried we’d be underwhelmed. The throngs of tourists had already started to annoy us slightly (although mornings never were good for me!!) and we dreaded feeling fraught and strung out all day. We walked through the check point and followed a small path which led through a stone tower entrance…and there it was…laid out before us. 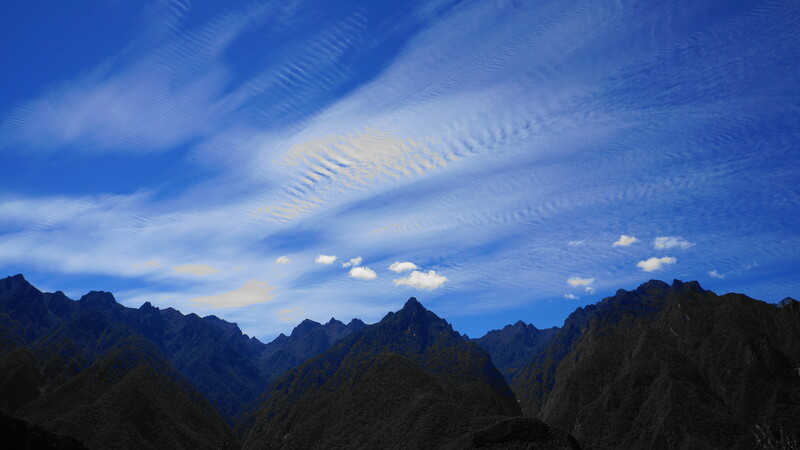 We couldn’t move or speak for a few seconds – both of us paralysed by its sheer grandeur and beauty. A few other tourists stood close by but we felt like the only people present in this magical world. The sky was getting lighter but the sun had not yet poked its head over the mountains. 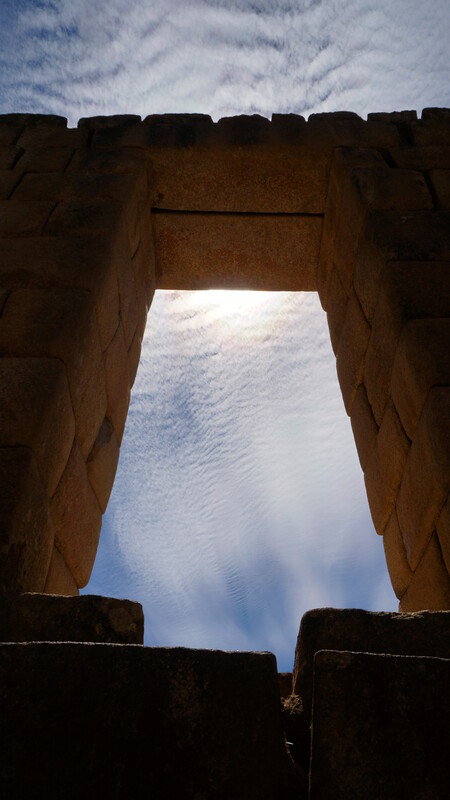 The stone work was silver/grey in colour and mirrored the mountainous landscape from which it had been carved. 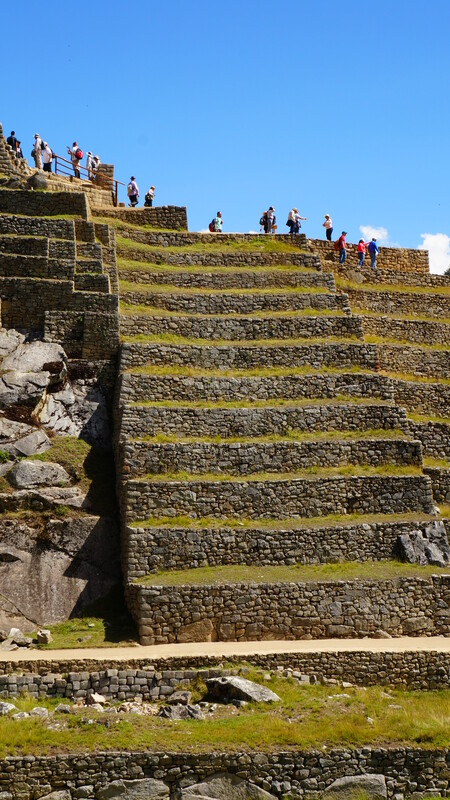 In front of us and cascading to our right we observed row upon row of steep agricultural terracing and beyond that the bulk of the ruins was made up with plazas, the royal palace, temples, tombs, industrial sectors and living quarters. It was simply incredible – beyond our wildest dreams. 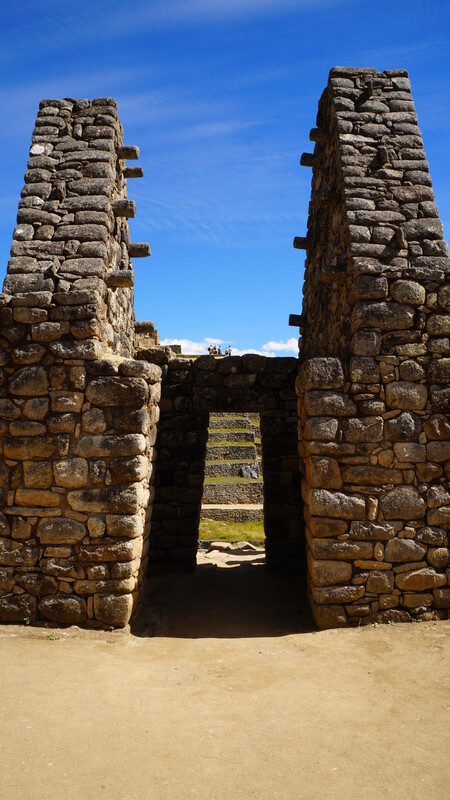 The Incas reigned for a relatively short period in history from the twelfth century to the early sixteenth century but it may have been longer if the Spanish Conquistadors hadn’t intervened. 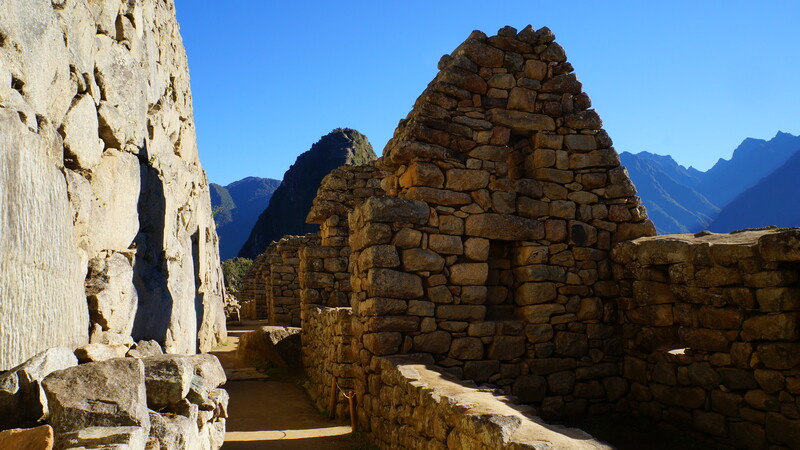 The first eight Inca Kings ruled peacefully for several hundred years but when the ninth Inca, Pachacutec, took power, a bloodthirsty drive for battle and expansion by force took over. 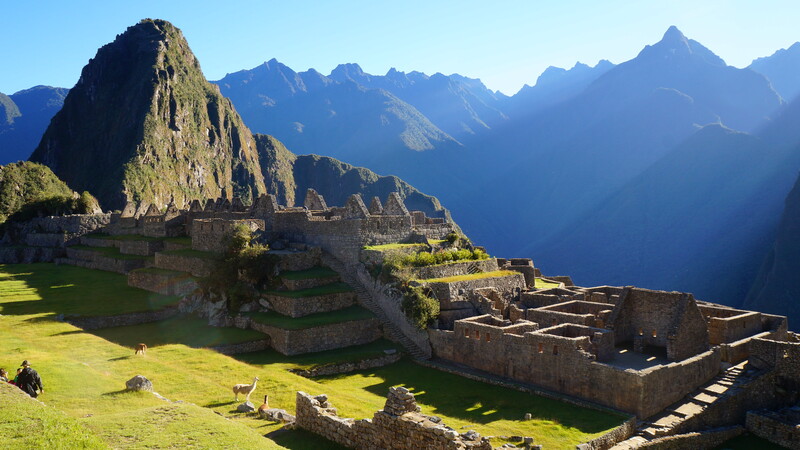 After defeating an opposing highland tribe called the Chankas, Pachacutec spent the next 25 years growing his empire until the Inca kingdom stretched from Ecuador and Colombia’s modern-day borders to Chile’s northern deserts – and it was during this golden period that Machu Picchu was created. 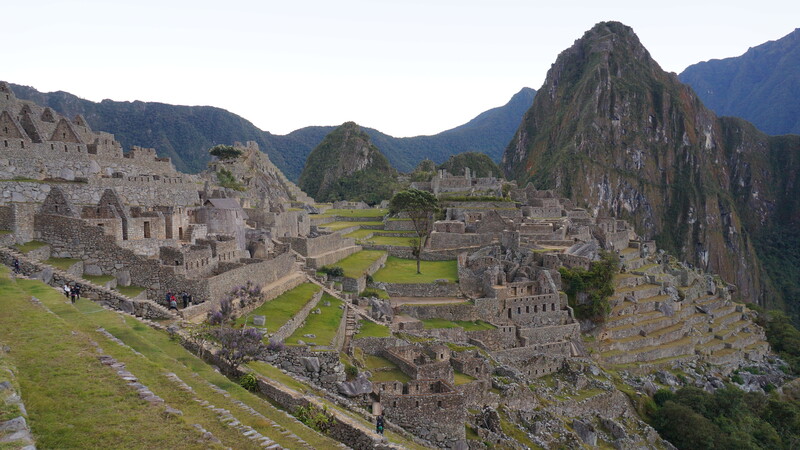 Historians suspect that Machu Picchu was an important ceremonial site and when the Spanish invaded it was simply abandoned and forgotten for nearly 400 years until it was rediscovered. We watched the sunrise from the top of the Sacred Plaza. The first place the sunlight hit was The Hut of The Caretaker, which is the only ruin to be fully restored with a thatched roof. Many tourists had chosen the terraces next to the hut to watch the sunrise and their eager faces glowed in the sun’s golden rays. Long shards of sunlight now stretched out from behind the mountains and lit up the small patches of rock it struck. As the sun’s orb came into view we were filled with a flutter of excitement and we watched the site grow even more beautiful than before. 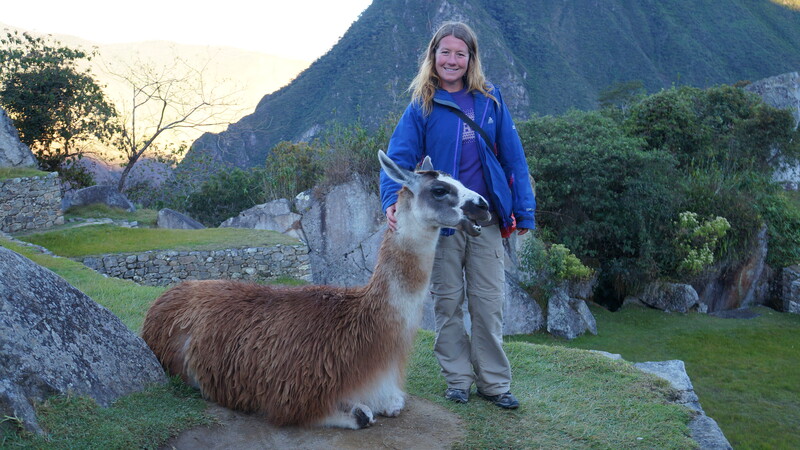 Cute llamas wandered freely on the green grass amongst the ruins and made for great photo opportunities. We’d seen many pictures of the site smothered in a layer of mist and we’d met one guy who couldn’t see all of the site due to cloud coverage, but we were blessed with deep blue sky and sunshine. There was lots to see at the site and each location offered us a new and interesting view. Everywhere we went involved a climb and our legs felt heavy but never stopped wanting to take us from one place to another. 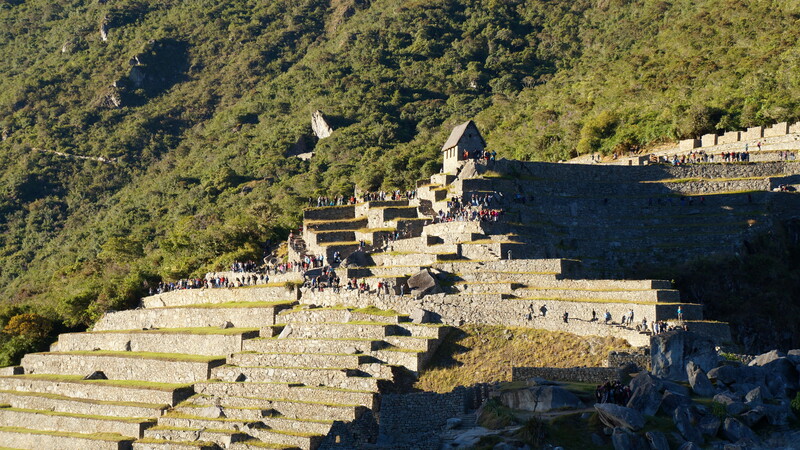 In some places the ruins and rows of terracing clung to the mountainside precariously. 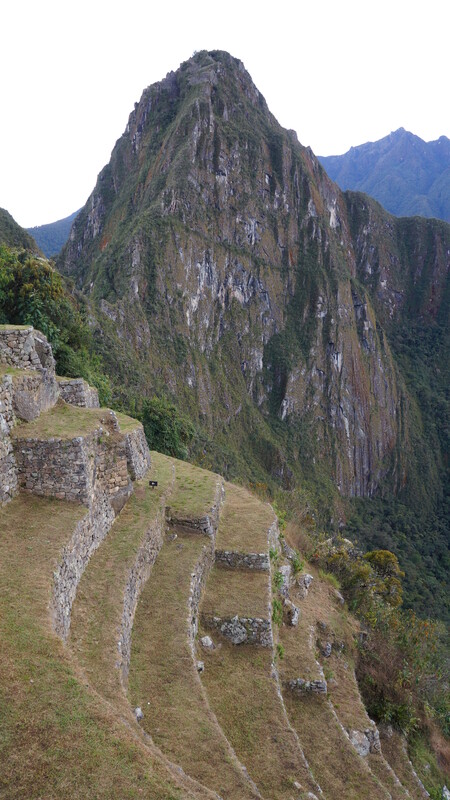 The thousands of people visiting Machu Picchu each year is taking its toll and scientists believe that the site is slipping at a rate of one centimetre per month and are encouraging the Peruvian government to take steps to protect the site and prevent further damage or, in a worst case scenario, a devastating collapse. The main body of the site is split into two sections. On one side the ceremonial and royal areas with intricately carved stonework, palaces, hidden stone caves with alters, ritualistic bathing pools, carved towers and rows of windows offering a glimpse of the spiritual world. On the other side, the stonework is said to be plainer and simpler (but to us it still looked incredible) offering a maze of nooks and passageways which made up the industrial and residential parts and which even housed a small jail. 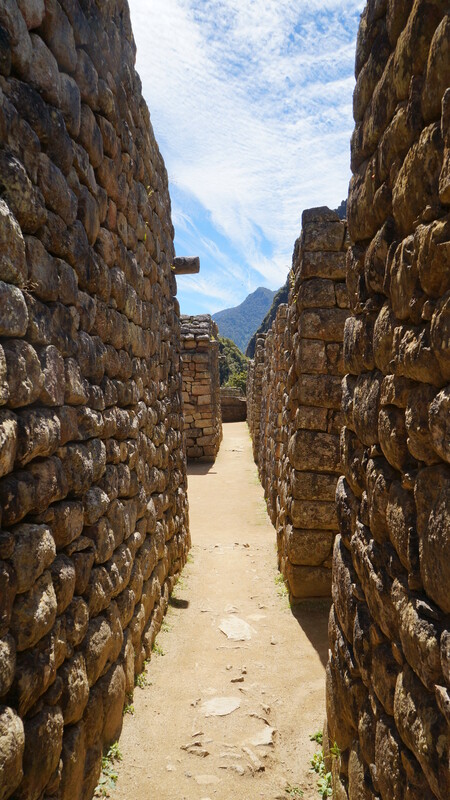 One of the major stone shrines at the site is known as Intihuatana or The Hitching Post of the Sun. It was here that the Incas used a small rock to mark the changing seasons and it’s the best spot for an overview of the whole site, if you can face the steps. Several groups of travellers gathered at the top feeling the sunshine on their faces and soaking in the views below them. 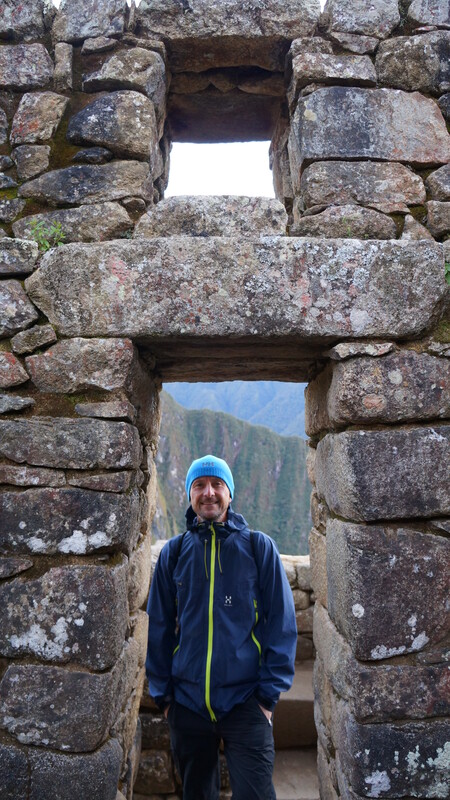 A 20 minute walk to the Inca drawbridge offered us superb views of the Urubamba valley, river and train line which we’d walked along the day before. In the distance snow-covered mountains were in our eye line from the winding, narrow path which hugged the cliffs. The drawbridge was used as a means of protection from enemies approaching across the mountains, and also as an escape route. 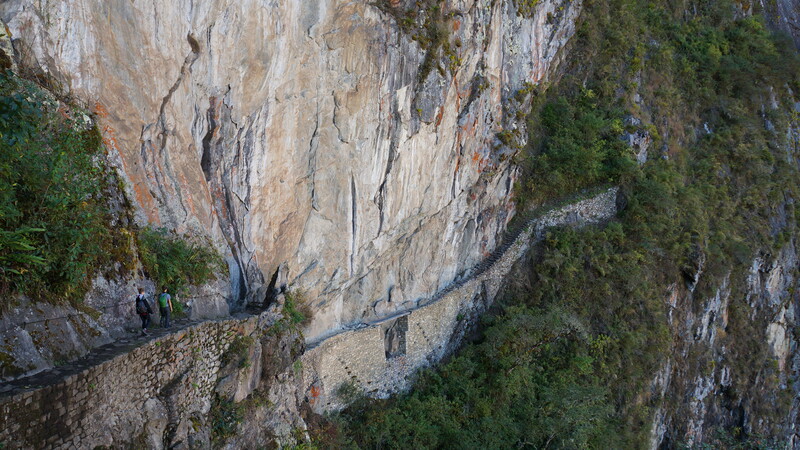 The path was an astonishing feat of engineering and we guessed that many lives must have been lost digging this path into sheer cliff walls. We winced as we saw two tourists up ahead of us and got a clear perspective of the path width to sheer vertical drop ratio! We bumped into old friends at the site – Jess, Anya and Sumitha and then Mathias. We spent some time chatting and sharing in the special moment with them all. 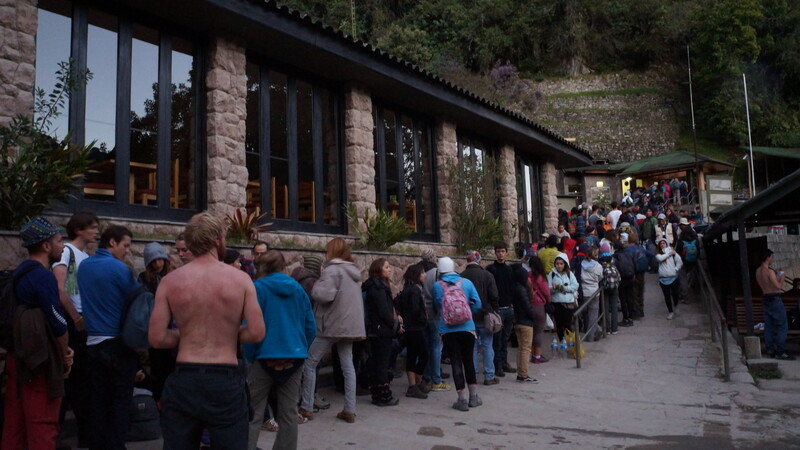 The site got busier as the day progressed and by 1.00pm, when the day tripper buses had arrived from Cusco, we knew it was time to leave. 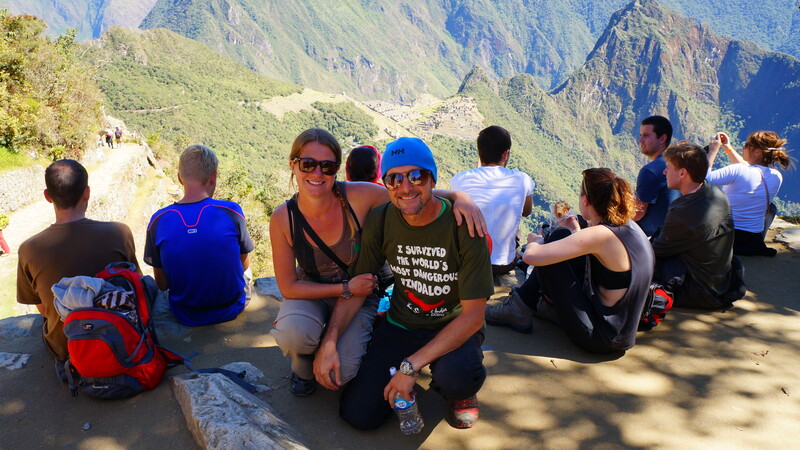 Machu Picchu promises to be one of Latin America’s biggest thrills and for us it didn’t disappoint. 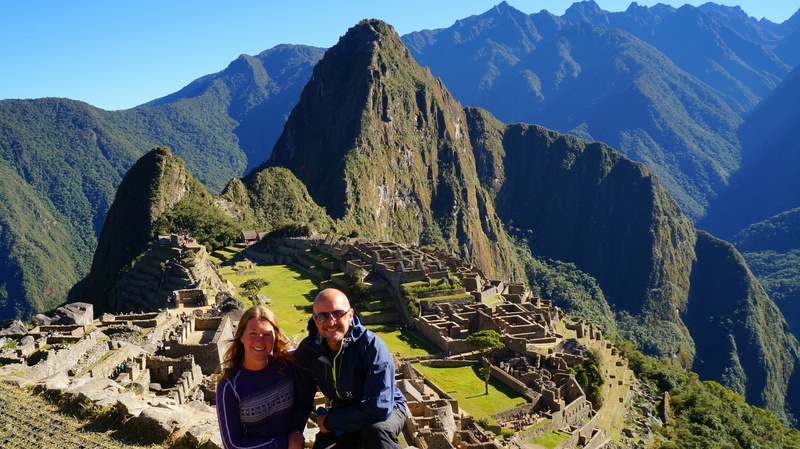 Our four-day pilgrimage to the site had pushed our strength and determination to the limit but somehow it made our arrival at Machu Picchu even more satisfying. 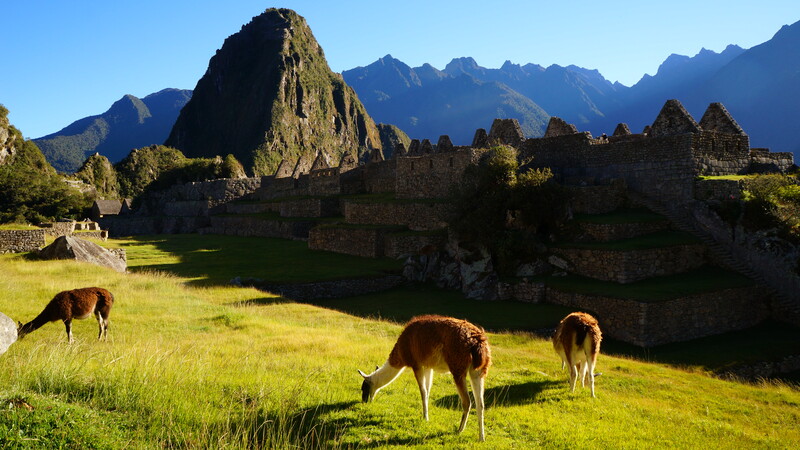 We were thankful that Machu Picchu was ‘lost’ for all those years and claimed only by nature, who hid it away from those who would seek to destroy it and all it stood for, until the time the world was ready to embrace it.